A new variation on the wild columbine, the aquilegia vulgaris 'Winky Double Red & White' will delight your garden. Great for lawn edgings, containers and lightly shaded woodland garden settings. This Red Columbine blooms in mid spring. This Red Columbine matures in the 12 to 14 inch height range which is just slightly taller than other varieties. The spring flowers sit above nicely compact foliage. The rounded blossoms are a mixture of burgundy red and white. Prune aquilegia back after spring blooming. 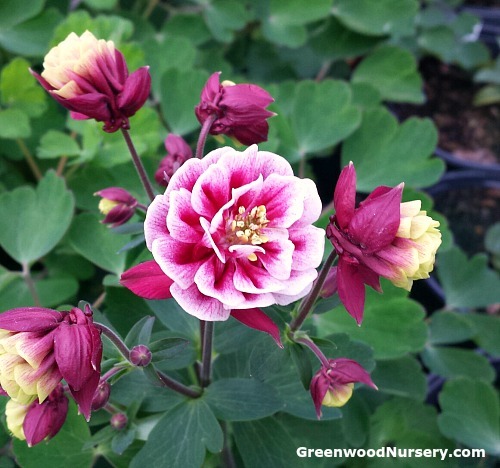 Aquilegia Winky Double Red and White Columbine is grown in a one gallon container. Orders shipping to AZ and CA will be bare rooted before being prepped for shipping.